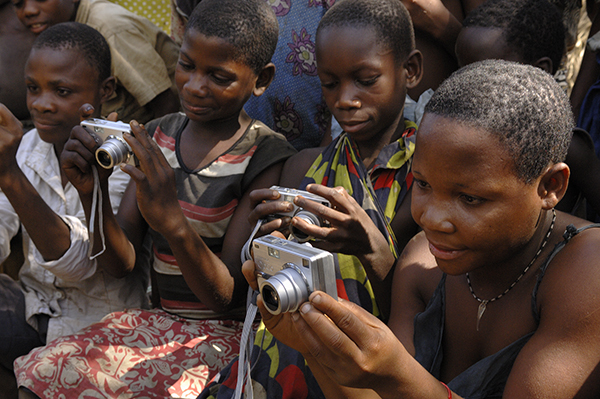 Cameras without Borders - Photography for Healing and Peace is devoted to collaborating with indigenous African communities struggling with the consequences of war and violence. The work is guided by the vision that experiences of shared humanity and curiosity about self and others are crucial for reconciliation and lasting peace. By creatively blending new digital technology with old healing methods Photography for Healing and Peace transcends personal and cultural layers of reference and rekindles the struggle of giving birth to one’s future. Cameras without Borders - Photography for Healing and Peace values mutuality and supports the sustainability of human well-being in its many forms. Copyright 2008-2018, Eberhard Riedel: Cameras without Borders. All rights reserved.